We are going to start offering our ladybugs in bulk packaged formats for those who may want to resell them. WE are starting with just one offer at this time and may expand in the near future. 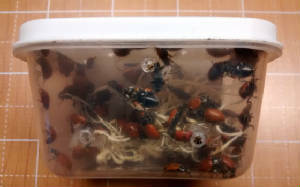 Small containers each contain 100+ premium live ladybugs, a small amount of excelsior for nesting and a small sponge for water. Containers measure approximately 2.5" X 2.0" X 1.5" and have pre made air vent holes. Minimum order is 10. These should be great for resale in small hydroponics stores, nurseries, garden supply stores and numerous other applications. MSRP $8.00 ea.